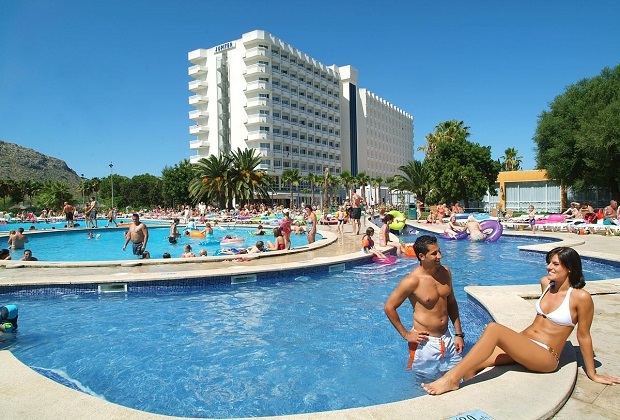 Our complex at Club MAC Alcudia is the perfect place to enjoy a sun-soaked, fun-filled family holiday. The resort complex itself is 100,000 square metres in size, and when you come through the entrance you’ll see our three main buildings. These are Jupiter, Marte and Saturno, all of which contain our bedrooms. Check out the different room types on our website and choose the right one for you. You can also upgrade when you arrive if you’d like to, just ask at reception. This is subject to availability and, of course, at an extra cost. We are just under 900 metres away from the gorgeous sandy beach of Alcudia. It’s an ideal beach to spend the day, with shallow waters ideal to splash about in and golden sand. We have a free shuttle bus that can take you and your family across to the beach at any time of the day. You’ll find the shuttle bus in front of Club Mac Marte. Our complex is built around two natural lakes, which beautifully surround the buildings on site. Next to the main lake you’ll find our relaxation area that’s perfect for a bit of time away from the hustle and bustle of the main resort. Here you can chill out, sun bathe and admire the scenery, and get a touch of pampering if you fancy it. We have our very own shop just by the entrance of Club Mac Marte, where you can pick up newspapers, magazines, souvenirs, sweets, clothes and lots of other things you might need for your holiday. Just inside the Jupiter building, you’ll find the Guest House reception, with all the information you need about our activities and entertainments. We have so much on offer, from football and mini golf to water sports and tennis. You’ll also find information on what there is to do in the town. We have customer service representatives on hand between 9:00 and 18:00 every day. We’ll make sure you’re never hungry while you’re at Club MAC! We pride ourselves on our good quality food and the choice our guests have. We have three main restaurants, one in each of the buildings, all of which serve breakfast, lunch and dinner at different times. There is food available from 8am until midnight, and soft drinks (including tea and coffee) available 24 hours a day. Everyone on site needs to wear their all-inclusive wrist band so that you can freely use all of our facilities. This will also get you into the Hidropark, the fun waterpark just across the road from our entrance. Behind the three main buildings, next to the lake, you’ll find the CIRCUS stage, while the smaller Saturno stage is found between Marte and Saturno. The CIRCUS stage offers a disco for children every evening, followed by a show for all the family. The Saturno stage is more adult orientated and has exciting acts including live music, DJs and karaoke. There is also a tennis court, a mini golf area, two indoor bars, six outdoor bars and plenty of space to kick back and relax. We look forward to welcoming you!